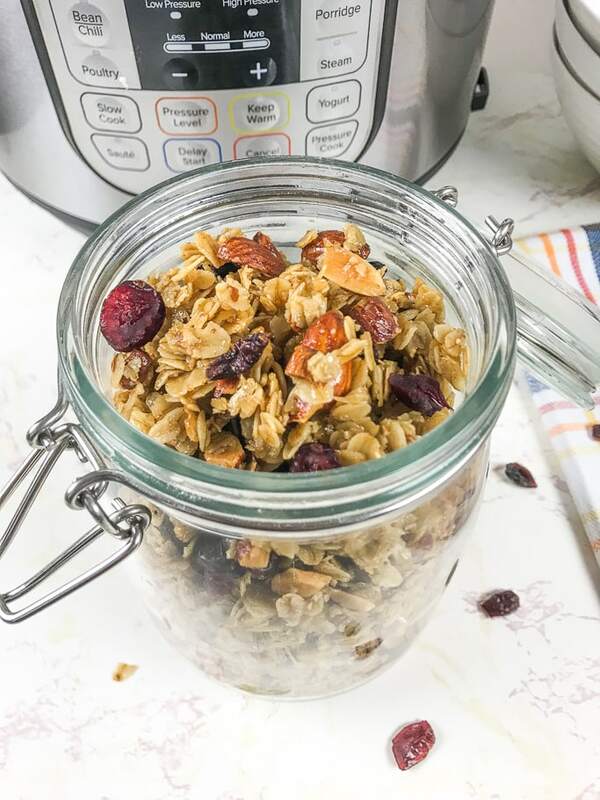 You are going to love this recipe for Instant Pot Granola. It is so easy to make and tastes way better than the store bought version! I love a good granola. I have been making my own on and off ever since my husband and I did the 100 days of real food challenge back in 2014. You see, our kitchen (suddenly) got torn out and left for dead for several months. We found ourselves eating fast food daily because we only had our kitchen table, grill, and bathroom sink to prepare meals (Sometimes we had our stove, but the whole rest of the kitchen was blocked off and a dusty mess). We also had two kids under two. It was rough, so we gave in and ate out for most meals. After we finally got out kitchen back we were both feeling yucky from all of the processed food and decided to try the 100 days of real food challenge. One of the things Lisa Leake (the founder) swore by was her own homemade granola. Naturally, I had to try it and got completely hooked. 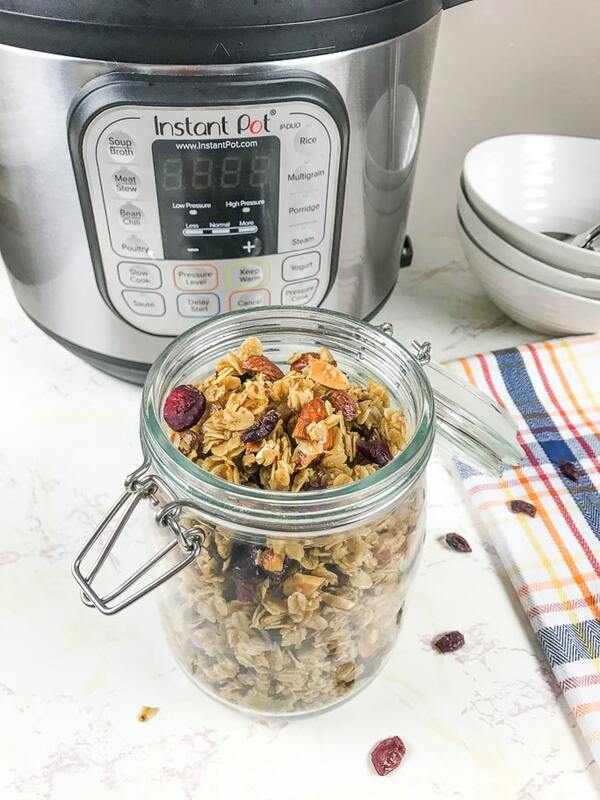 Today, I’m going to share a trick for making granola in your Instant Pot. 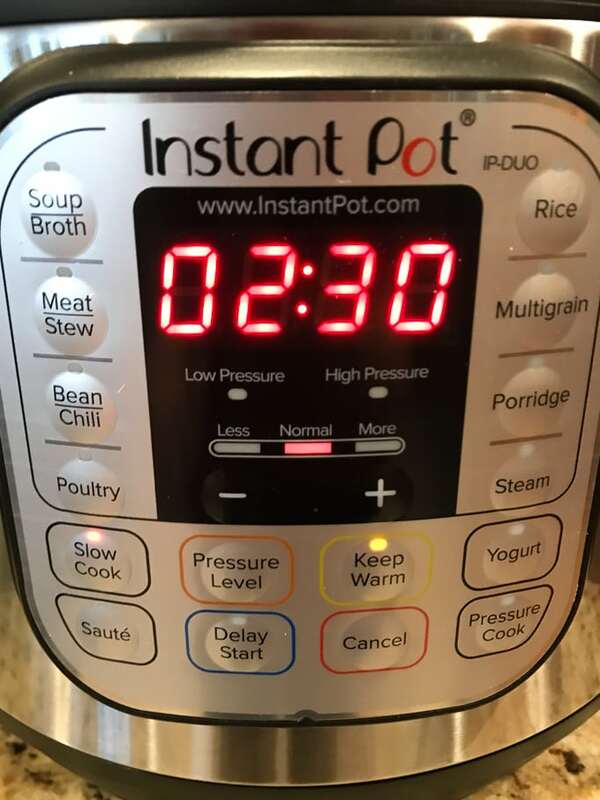 Since most of us are in love with our Instant Pots and want to use them as much as possible, I am on a mission to come up with new and interesting ways to use your Instant Pot. This recipe for instant pot granola is definately one of those times. The trick to making this granola recipe super crunchy and delicious is to cover the pot, but not all the way. I used one of my glass lids from my pots and pan set and covered 3/4 of the pot. 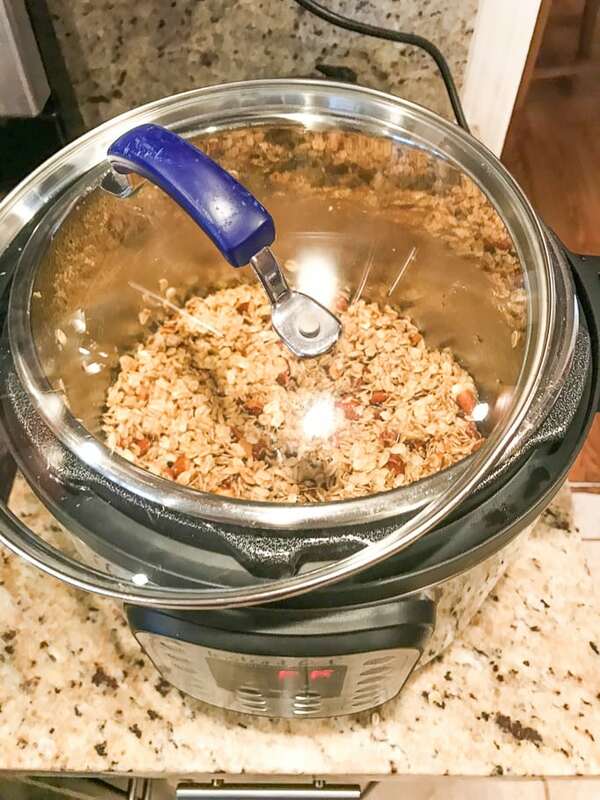 This left just enough air flow to let the homemade granola crisp up while it slow cooked in the Instant Pot. Mixing it every 30 minutes or so also helps it cook evenly. Once it’s done cooking, spread it out onto a cookie sheet for faster cooling. As mentioned about, the trick to a crispy homemade granola is to keep the lid partially open. That means you don’t want to use the regular Instant Pot lid. If you don’t have a lid that will work, just partially cover the top of the instant pot with foil. 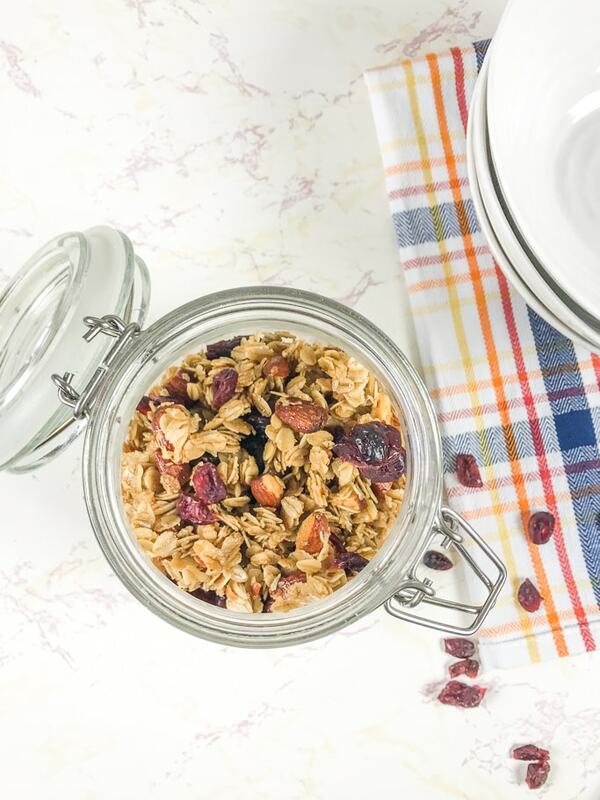 If you want to customize this instant pot granola recipe, you can switch out the almonds for your favorite nut, or a combination of more than one nut. Raw nuts are fine as they will toast in the Instant Pot. You can also customize the dried fruit, just wait to mix it in at the end. Want a sweeter granola? 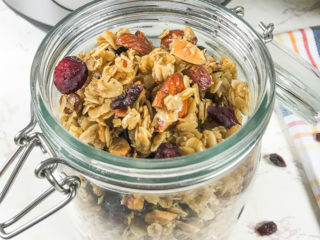 This granola does have a good amount of honey and brown sugar in it, but you could add mini chocolate chips after the instant pot granola cools for an extra treat. Granola is very versatile. You can eat it as cereal with milk or serve it over yogurt (check out this recipe for Instant Pot yogurt). Granola also makes a great snack. Just throw it in some baggies and bring it with you like you would trail mix. 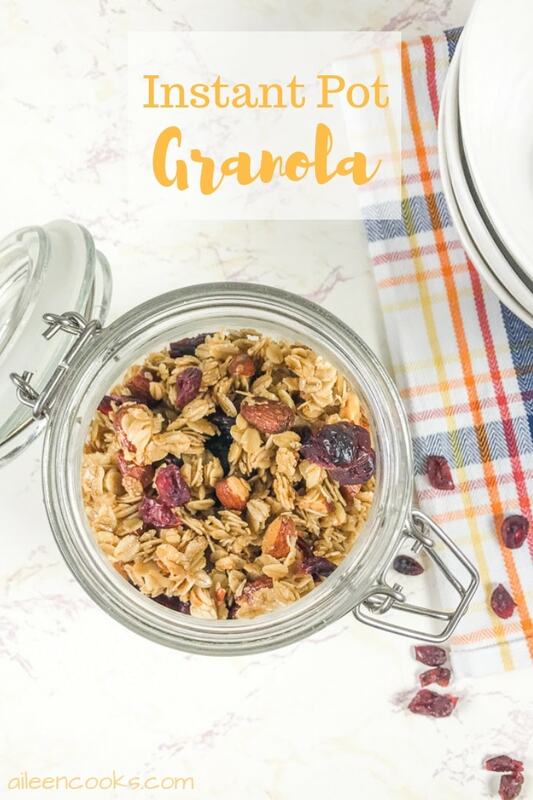 Instant pot granola is a super customizable recipe that can be changed to match your favorite flavors. Spray the inside of the Instant Pot with cooking spray. 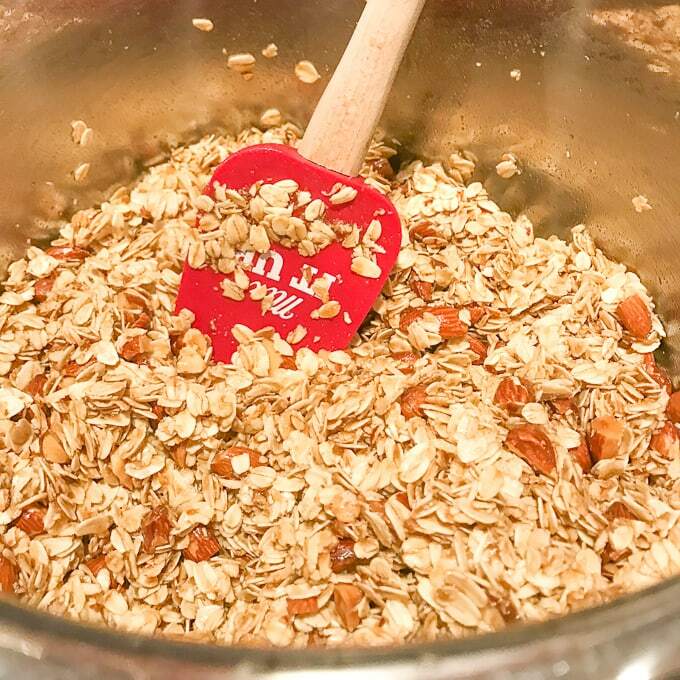 Pour in the rolled oats, almonds, brown sugar, cinnamon, and salt. Mix. In a small bowl, whisk together the olive oil, honey, and vanilla. Pour the wet ingredients over the dry ingredients and mix until fully combined. Cover partially with a glass lid, leaving about 3 inches of open air. Press the Slow Cook button and adjust the time to 2.5 hours. Let cook, stirring every 30 minutes. 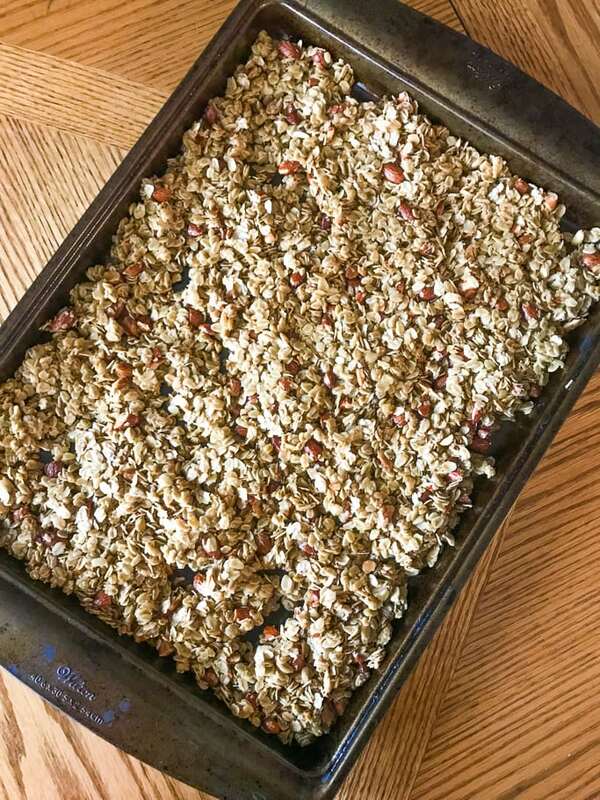 Remove granola from the Instant Pot® and spread onto a cookie sheet. Let cool. Pour cooled granola into an air-tight container. Store at room temperature for 5-7 days. Hi Kathy! I used old-fashioned, so you should be good to go. Thank you! Very good flavor!! !